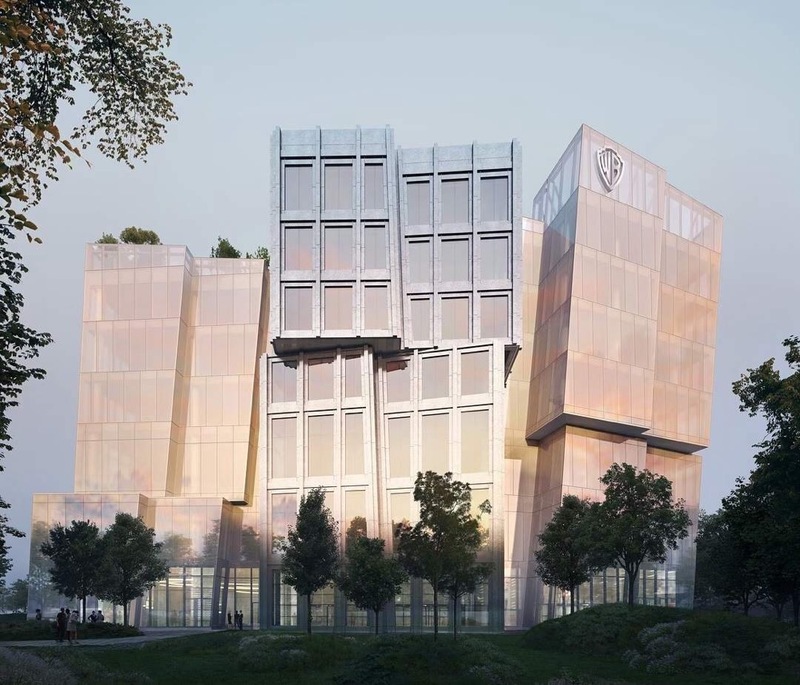 Gehry Partners, Worthe Real Estate Group, and Stockbridge Real Estate Fund have unveiled renderings for a new 800,000-square-foot office complex slated for the Warner Bros. studio campus in Burbank, California. Urbanize.LA reported that the developers behind the so-called "Second Century Project” aim to break ground later this year and that the project will be completed in time for Warner Bros.’ centennial celebrations in 2023. Plans for the complex call for a pair of cool, iceberg-like mid-rise office towers articulated in Frank Gehry’s signature fluted and twisted forms. One tower will rise seven stories and is set to contain 355,000 square feet of offices while the second tower will rise nine stories high and offer 450,000 square feet of office space. In a press release announcing the project, Gehry said, “Once upon a time, Hollywood Studios had an important architectural presence in the city—they were like monuments to the movie-making process. With this project, I was trying to recapture that feeling of old Hollywood splendor.” To achieve his goal, Gehry Partners has created a two-faced complex. For the more public exposure that faces an adjacent freeway, the architects have designed icy glass facades that will catch the sunlight. Renderings for the project show the towers ablaze in Southern California’s red-orange-pink golden hour light, for example. The office’s second main exposure, which the architects have wrapped in perforated metal panels, will face existing warehouse-like studio spaces. Gehry added, “We created large open floorplates with the single goal of creating the highest quality office space. From the freeway, the buildings are composed as one long sculptural glass facade that creates a single identity like icebergs floating along the freeway. On the studio side, the metal punched facade is terraced to relate to the scale and character of the existing studio buildings.” The project is the latest local proposal from the ever-busy Gehry Partners. Other projects on deck include the Youth Orchestra of Los Angeles project in South Los Angeles, a planned hotel and mixed-income housing complex in Santa Monica, the controversial 8150 Sunset mixed-use complex, and The Grand, a pair of mixed-use residential towers slated for a site directly across the street from Gehry Partners’ Walt Disney Concert Hall in Downtown Los Angeles, among others. Last week Microsoft submitted plans to the city of Mountain View to expand its Silicon Valley headquarters. As with Apple's upcoming building and Google's proposed campus, this one is also pastoral and eco-minded. 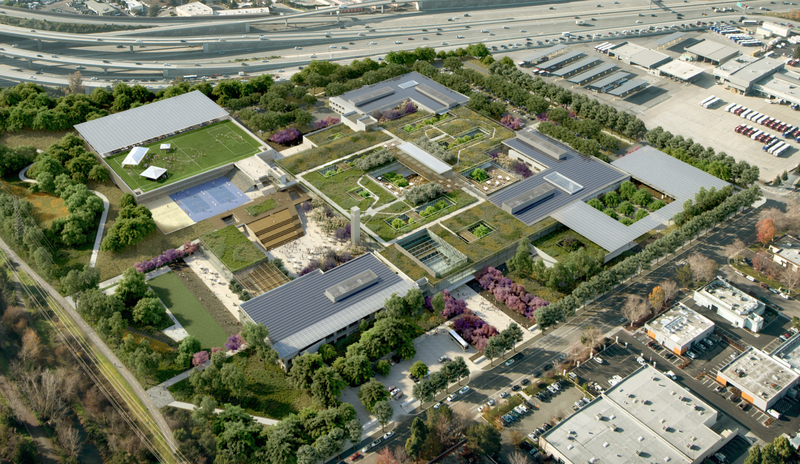 A rendering by shows the low-rise office buildings enmeshed in a riparian landscape and topped by an expanse of verdant meadow. According to the Silicon Valley Business Journal, WRNS Studio replaced SOM on the job. This new scheme not only updates the 515,000-square-foot campus, but also adds 128,000 square feet of workspace and 164,000 square feet of green roof. Changing the paradigm for parking, the design will restore more than 6 acres of asphalt surface parking into a “creekside environment.” But don’t expect a decreased demand for parking spaces, there’s talk of a new garage topped by a soccer field. "They’ve talked to us from square one about taking all the parking adjacent to Stevens Creek and turning that to habitat," said Mountain View Community development director Randy Tsuda told SVBJ. The tech behemoth also intends to buy the property, which it now leases. In an email to employees executive vice president Qi Lu wrote, “Today, I am excited to announce our plan to further invest in the success of the Silicon Valley region. Microsoft is acquiring the Mountain View Silicon Valley Campus to build a state-of-the-art facility and create an exceptional place to work... Sustainability, collaboration, and health & wellness are at the center of the design, incorporating features such as team courtyards, easy access to the outdoors, an onsite gym, and LEED Platinum certification.” WRNS’s plan calls for demolishing and rebuilding two existing buildings and infilling much of the campus with courtyards and outdoor spaces, while new programs along Macon Street and La Avenida Streets will directly engage with the community. Construction is expected to start in early 2017. Silicon Valley definitely has the architecture bug. We've recently seen remarkable new designs put forth by Foster + Partners for Apple and NBBJ for Samsung. 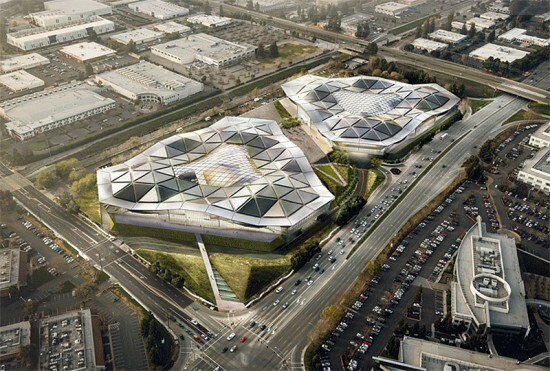 Now Gensler has released ambitious new designs for tech company Nvidia, located in Santa Clara. The 24-acre complex's two 500,000-square-foot buildings are each shaped like triangles, a configuration that Gensler principal Hao Ko explains facilitates collaboration by allowing connections to each side of the building to be the shortest. (The triangle, he adds, is also "the fundamental primitive that defines all shapes in the digital realm.") Undulating roofs will be made up of smaller triangle pieces, breaking down the overall mass and allowing for ample skylighting, in the in-between spaces. Construction is set to begin this summer, with completion in 2015. Apple's circle now has geometric competition. Who's next?